NEW YORK, August 9, 2018 — The One Club for Creativity, the world's foremost non-profit organization recognizing creative excellence in advertising and design, today launched a teaser to a humorous new “Win Pencil, Draw Respect” campaign developed by Toronto agency Zulu Alpha Kilo to announce the call for entries for the prestigious 2019 One Show awards. The One Show entries can be submitted now at http://www.oneshow.org. First deadline is September 30, 2018, followed by November 30 and final deadline for entry of January 31, 2019. One Show juries will be announced shortly. The campaign is being teased now with posters, banners and simple animated videos, to be followed by a series of online videos in the fall. The work uses before-and-after scenarios to depict how the life of a creative person improves dramatically once they win a coveted One Show Pencil: bosses put more faith in you, you get to work on better briefs and maybe even get a raise and better office. But most of all, you get respect. One very timely poster shows four vertically stacked One Show Pencils on a dark background. 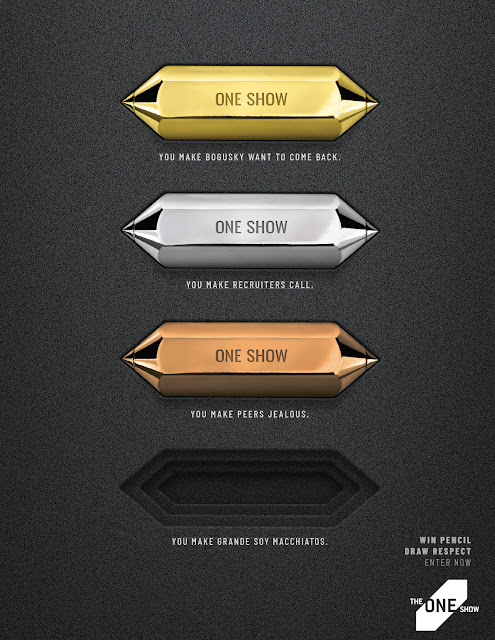 The caption for the top spot featuring the Gold Pencil reads “You Make Bogusky Want To Come Back”, followed by the Silver Pencil with the caption “You Make Recruiters Call” and the Bronze Pencil with “You Make Peers Jealous”. The bottom spot on the poster shows the empty outline of a One Show Pencil, implying no Pencil has been won, with the caption “You Make Grande Soy Macchiatos”. One animated video entitled “Not Hiring" starts with “We’re Not Hiring Anyone”, and is then expanded to read ““We’re Not Hiring Anyone But You”, with the words “But” and “You” superimposed on two Gold Pencils and inserted into the original sentence. The video “Recruiters” begins with “Recruiters Stop Calling”, then expands to read “Recruiters Won’t Stop Calling” with the addition of a Gold Pencil. All teaser videos end with the “Win Pencil, Draw Respect” tagline. A number of changes are being announced to this year’s One Show categories in order to keep ahead of the industry. New disciplines this year include “Creative Effectiveness”, “Creative Use of Data”, “Digital Craft” (formerly UX/UI, includes all craft categories in “Interactive” and “Mobile”), “Experiential & Immersive” (replaces “Responsive Environments” and includes all immersive work previously in “Cross-Platform”), “Integrated” (previously “Cross-Platform”), “Interactive & Online (previously just “Interactive”) and “Radio & Audio” (previously just “Radio”). It’s also the second year for the One Show Mobile-First Video Advertising category, sponsored by Facebook. The category was established for video that is specifically created for use on mobile devices. Entries must be in vertical format, comprehensible with and without sound and created to promote a brand product or service. New this year, the Mobile First is split into two categories: one for videos over 15 seconds in length, and one for video 15 seconds long and under. Swanepoel adds that entering work in the One Show also helps the industry overall because The One Club is a global non-profit organization that uses awards revenue to give back to the industry through nearly two dozen education, professional development, gender equality and inclusion and diversity programs for creatives around the world at all levels.